Aditi Dubey has been awarded the Outstanding Graduate Student Assembly Member Award! This award honors scholar-leaders for their outstanding contributions to service and involvement at the University of Maryland. Congratulations! Congratulations to Maggie Lewis who won first place at the ESA Eastern Branch Meeting! Her talk was titled: "Interactions between spotted-wing drosophila and fruit rot fungi in fall red raspberries." Congratulations to Dr. Kelly Hamby for being named an honoree at the Inaugural Maryland Research Excellence Celebration! Honorees were nominated by their college deans for their demonstrable elevation of the visibility and reputation of the University of Maryland Research Enterprise. A warm welcome to Maria Cramer who has joined the Hamby lab as a graduate research technican! The Hamby lab is happy to announce that Torsten Schöneberg and Edwin Afful will be joining us as postdoctoral researchers! We would also like to welcome Sophia Heitzig who has joined our lab as an undergraduate research technician. Welcome! The Hamby lab is seeking 2-3 undergraduate students for a research position to provide both laboratory and field work assistance. Review of applications will begin on May 11th and will remain open until the positions are filled. More information is available here. We would like to give a warm welcome to Anna Alesho who has recently joined our lab as an intern! She is a Plant Sciences master's student from Wageningen University and Research in The Netherlands. The Hamby lab is currently seeking a postdoctoral scholar who has an interest in developing sustainable insect management programs in small fruit or agronomic crops. This is a great opportunity for someone interested in integrated pest management, invasive species, and/or insect-microorganism interactions. Applications received before April 1st will receive priority, but the position will remain open until filled. More information is available here. A huge congratulations to Dr. Kelly Hamby for receiving the Early Career Professional Extension Award at the annual Entomological Society of America conference in Denver this year! Another congratulations is in order for Aditi Dubey who just passed her Ph.D. qualifying exam! Congratulations and welcome to Logan Miller, Pranish Katwal, Robert Starkenburg, and Alyssa Truong on being selected to become student researchers in the Hamby Lab! The Hamby Lab would also like to give a warm welcome to Arielle Arsenault-Benoit, who will be joining us as a Faculty Research Assistant! Congratulations to now alumnus lab member Dr. Chris Taylor on his new employment! The Hamby lab wishes you the best on your new career and has greatly appreciated all the work you've done with us! Aditi Dubey won another award this month! Congratulations on winning 3rd place in the PhD Student Oral Competition at the Eastern Branch Entomological Society of America meeting last week! The Hamby lab is currently seeking 2-3 undergraduate students for a summer research position to provide both laboratory and field work assistance. More information is available here. Congratulations to recent graduate Joshua Yeroshefsky on becoming the new research assistant and lab manager for the Hamby and Fritz labs! The Hamby and Fritz lab are currently seeking a faculty research assistant to provide laboratory and field research support. Details are available here. Welcome to Elizabeth Hines, who recently joined the Hamby lab as a student researcher! 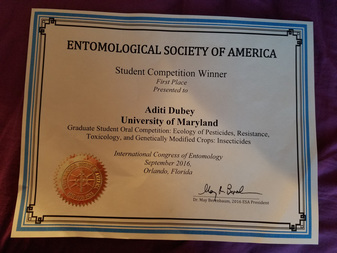 Aditi Dubey places first in the graduate student oral competition at the International Congress of Entomology in Orlando, FL. Her presentations was titled "Non Target Impacts of Neonicotinoid Seed Treatments in a Three Year Crop Rotation". Congratulations Addie! Welcome to Jessica Van Horn, who will be joining the Hamby Lab as a student researcher! Aditi Dubey's NE SARE grant was recently funded and will support her work studying the non-target effects of neonicotinoid seed treatments and their impacts on the soil microbial community. Congratulations! We welcome student researchers Adrienne Beerman and Claire Weber to the Hamby Lab! Dr. Chris Taylor joins the Hamby lab as a post-doctoral researcher. Chris will be investigating various cultural control tactics for SWD among other projects. Welcome! The Hamby lab is currently seeking a post-doctoral researcher to work on agricultural pest management in a variety of cropping systems. Applications received before January 1st will receive priority, but the position will remain open until filled. More information is available here.